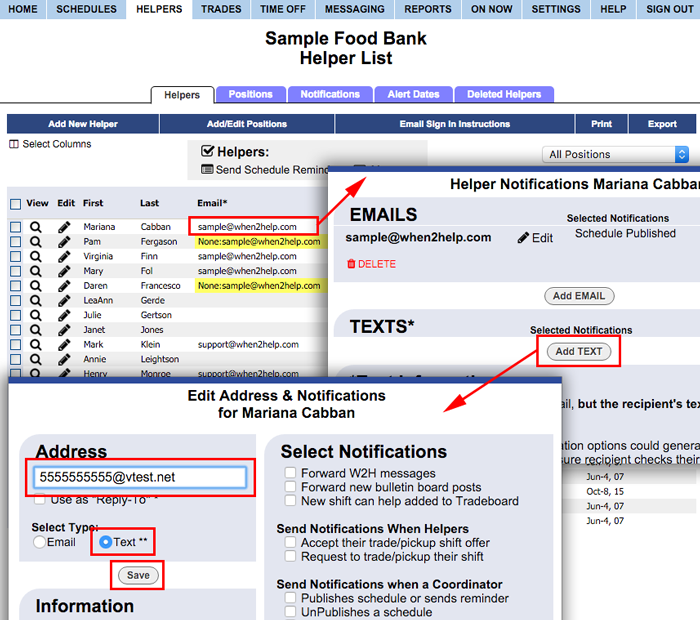 If a user has a cell phone and service that allows receipt of text messages, they can sign in at WhenToHelp.com and set up when to be notified by text message. Helpers sign in and set up their own text message address and choice of notifications. Coordinators can review their notifications options from the Edit Helper page. To send a text message, you need to know the person's "text message address" which is usually their cell phone digits @ the cell carrier's domain address. Ex. 5555555555@vtext.net You will need to ask each Helper to enter their own text address or have them find out from their carrier what their address would be. The best way to find out your text email address is to send a text from your phone to your email and then note the "from address" in that email. When a text message address is added, a special verification PIN is sent to that address. The recipient must then sign into their WhenToHelp account and enter the verification code in order to confirm that the address is correct. Once this has been done, the notifications will be sent out automatically from that time forward. Helpers can enter their verification PIN on the INFO>Edit My Email Notifications page.